Our native Eastern White Pine is a stately miniature tree with long fine needles clustered in 5's along the branches which gives a soft, feathery look. 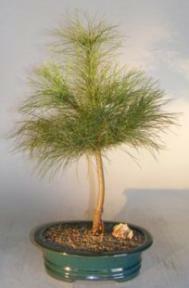 Has beautiful gray/blue needles and grows very slowly. Outdoor evergreen, keep outdoors.